Choose Your Shape and Size! Build a raised bed garden anywhere the sun shines! L-shaped raised beds fit perfectly in the corner of a yard, or arranged in pairs to enclose an area and form wide entrance pathways to your garden. L-shaped garden beds can be used with other planter shapes to create endless garden designs and large, productive vegetable gardens. They work great as privacy screens, with flowering vines and matching garden trellises. All sizes of L-shaped garden beds are available with optional trim packs, for a more finished look and a convenient place to sit while working in the garden. Planter bottom options are also available, to provide soil drainage on hard surfaces, such as patio and rooftop gardens. Raised bed planters are made from naturally durable cedar protected by a non-toxic waterproof sealant that is safe for edible gardens. Raised beds can be built in custom shapes and sizes. Please let us know if you need help designing a garden. Easy assembly—just stack boards and insert corner pins. Build raised bed gardens in endless shapes and sizes. Optional trim packs and planter bottoms for any size bed. Width - Raised beds around 3 to 4 feet wide provide the most growing space while still allowing access to the center of the bed. Narrower raised beds, 1.5 to 2 feet wide, are useful for along fences and the sides of houses, or wherever access is limited to one side. Length - Raised beds can be any length, but are typically 12 feet or shorter, to allow for pathways between beds. Keep in mind that longer beds may be harder to level—short beds are easier on slopes. Height - Raised beds can be built as tall as you like in 5.5 inch board layers, the most popular heights being 11 to 22 inches. Taller raised beds reduce the need for bending over, help deter pests, and provide soil space for deep-rooted vegetables. Trim Packs - Trim pack options offer increased durability and a more finished look, as well as a convenient place to sit and rest tools while working in the garden. Planter Bottoms - Planter bottom options provide drainage on hard surfaces such as concrete, allowing full-size vegetable gardens on rooftops, driveways and parking lots. All of our raised garden beds are made from durable cedar protected by a non-toxic waterproof sealant that is safe for vegetable gardening. Raised beds are available in hundreds of shapes and sizes—many more than listed above. If you don’t see what you’re looking for, just ask. We'll help you build the perfect garden. 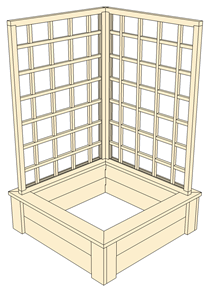 Trellises are available for any size raised bed! See prices and sizes. 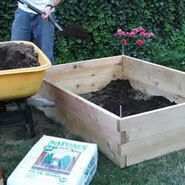 Raised garden beds can be set up directly on lawn, sand or gravel and dirt. For gardens on rooftops, decks and patios, optional planter bottoms are recommended to improve soil drainage and help protect the surface below. If the ground below is toxic, planter bottoms lined with barrier cloth will help keep plant roots safe from exposure. Build raised beds in a flat and open area, if possible, for easy access and sun exposure. Pathways around raised beds should be 18 to 24 inches wide for normal foot traffic and 36 to 48 inches for wheelbarrow and wheelchair access. Level the ground and follow these simple assembly instructions to set up your raised beds. Add an optional drainage layer, then fill raised beds with a healthy soil mixture and you’re ready to plant! You can find more tips on building a raised bed garden in our gardening help section, or contact us with your specific needs for free garden planning and advice. If you have any questions, please send us an email or call 1-800-807-3404 to speak with one of our friendly gardening advisors. Easy to assemble Raised beds assemble in minutes with no tools required, disassemble just as easily. Garden anywhereBuild raised beds on lawn and dirt. Add planter bottoms for gardens on rooftops and parking lots. Flexible design Hundreds of shapes and sizes to choose from, from small flower boxes to large garden beds. Superior strength Corner pin construction stays strong with swelling and shrinking of wood. Durable cedar Naturally rot-resistant cedar protected by a non-toxic waterproof sealant long outlasts lumber found in stores. 10 year warranty Raised beds with trim packs are covered by a 10 year limited warranty. Satisfaction guaranteed If you are not satisfied for any reason, just return the item within 30 days for a full refund. "This item is ingenious; I have rarely been so satisfied with a purchase." "Beautiful garden beds. Look fantastic on my farm." Need Help Planning a Garden? Not sure what kind of garden planter is best for your growing space? We would love to help you figure it out. Our dedicated and knowledgeable gardener support staff is here to help you cultivate your green thumb. Give us a call at 1-800-807-3404 for tips and advice on planning the perfect garden. These people make a great product. Their raised beds are ridiculously easy to assemble and install. The finished bed looks like I paid a professional to install it. The bed is perfectly straight and level and all the seams are tight. Like the previous reviewer stated, moving the boxes into the back yard and unpacking them was more of a chore than putting the bed together. I would guess it took me about 20 minutes to build a 2’ x 16’ x 11” bed. I was able to fill it and plant it that same day, and FedEx delivered it around 3pm. If you need a raised bed, I would definitely recommend this to you and know that you would be very happy that I did. I recently purchased a raised cedar bed from Naturalyards and I am delighted with my purchase. The bed required assembly, but no tools were needed. I put together a 4x6 foot 16.5 inch deep bed in about 10 minutes. It took me longer to get the pieces out of the boxes than it did to assemble them. Things I particularly like about this vendor are: 1) that they have different grades of wood; 2) that the price includes shipping; 3) the speed with which the bed was delivered; and 4) the very nice people that I dealt with when ordering. I highly recommend this vendor. I love my raised beds! I ordered one and it worked out so well, I recently ordered two more. The boxes are beautiful, my first one even looks better than it did when it first arrived - the color has darkened to a lovely shade. Also, I have never had such incredibly huge tomato plants. Every one who sees them, asks me what I've done to make them so healthy. I tell them it is the raised bed and fresh soil. Your service is also excellent. © 2019 Naturalyards, LLC, PO Box 3180, Ashland, OR 97520.